Hello, hello hello! Happy 2011, and thank you for choosing to visit with me here on the Treacle and Ink blog at the beginning of this new year. I must say, I am glad to be back, dusting off the blogging cobwebs…blogwebs?… and discovering a new routine. I have been shamefully absent these past two months for one very good reason – my new job. While I entered into this new occupation with high hopes and a positive outlook, I was not anticipating the physical, as well as mental taxation that I was going to undergo. There is just so much new stuff to wrap my head around, and the pressure of excelling in my work, and getting used to sitting at a desk all day…ugh! As a result, I have come home at the end of every day completely exhausted, without the motivation to do anything but veg on the couch. The time has come to put a stop to that! I can either revel in my lethargy, or I can choose to re-take my life. No more coming home every day and just sitting around. After all, energy can come out of doing, and especially crafty doing. So, let’s get to the crafty doing. Even though the blog has been completely neglected lately, crafting has still received a little share of my time. On a visit to the doctor’s office about a year ago, I was looking for a writing utensil with which to fill out my check, when the nurse casually said, “The flowers are pens.” How cute is that? I have since seen these all over the place, as I’m sure many of you have as well. There must be plenty of tutorials on the web addressing this particular craft, so instead of going into a fully detailed one of my own, I’ll just give you a quick run-down. 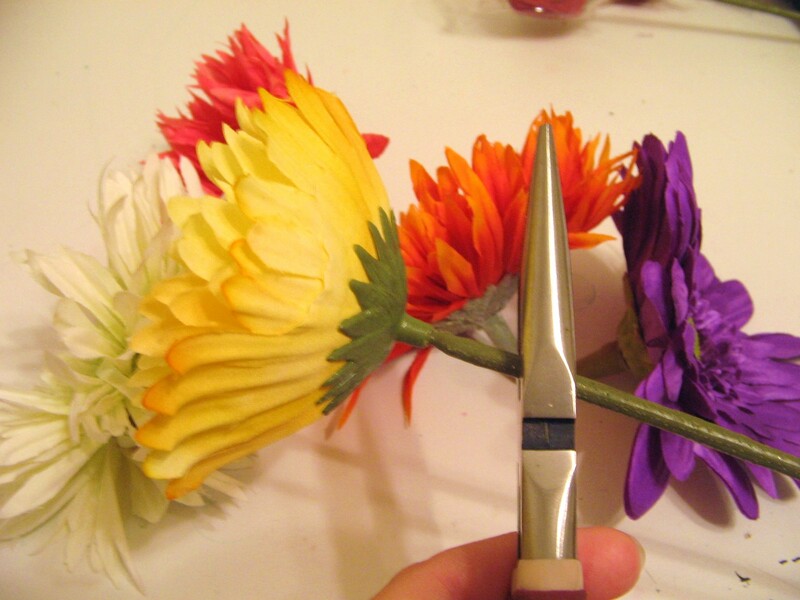 Cut the heads off of the flowers. Wire the flower heads to the tops of the pens. 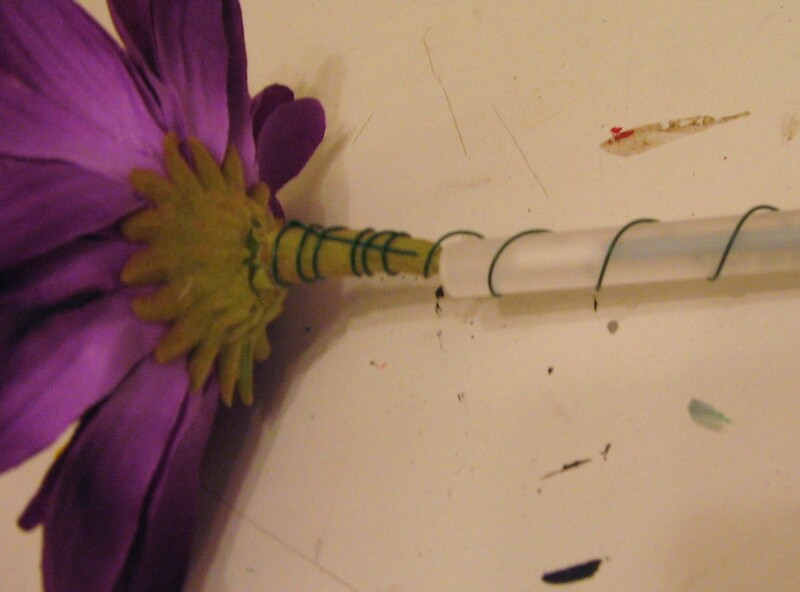 Wrap the floral ribbon from the base of the flower petals to the ends of the pen bodies. 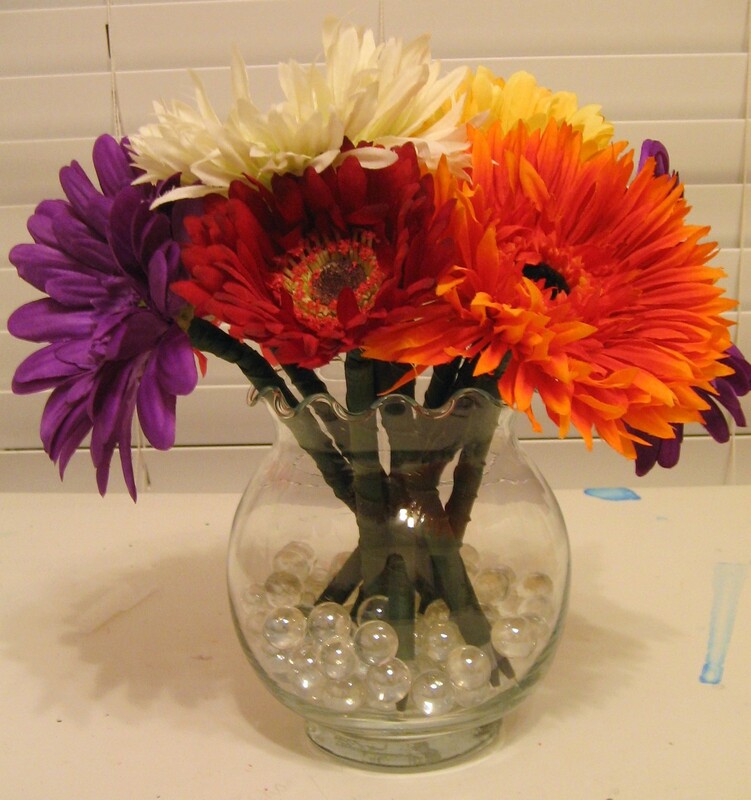 Arrange the flowers in a vase filled with pebbles/marbles/ or other vase filling, and enjoy! And that’s it! 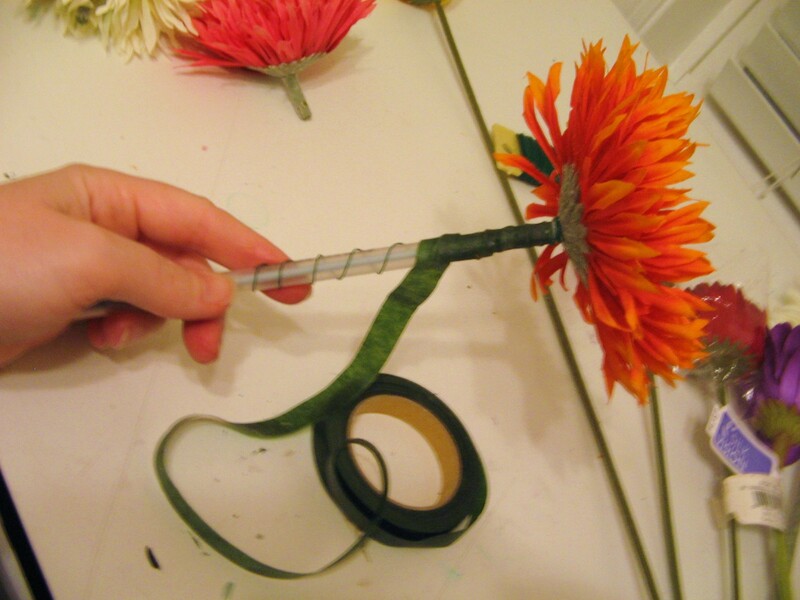 It’s a really simple and fairly inexpensive craft to undertake. 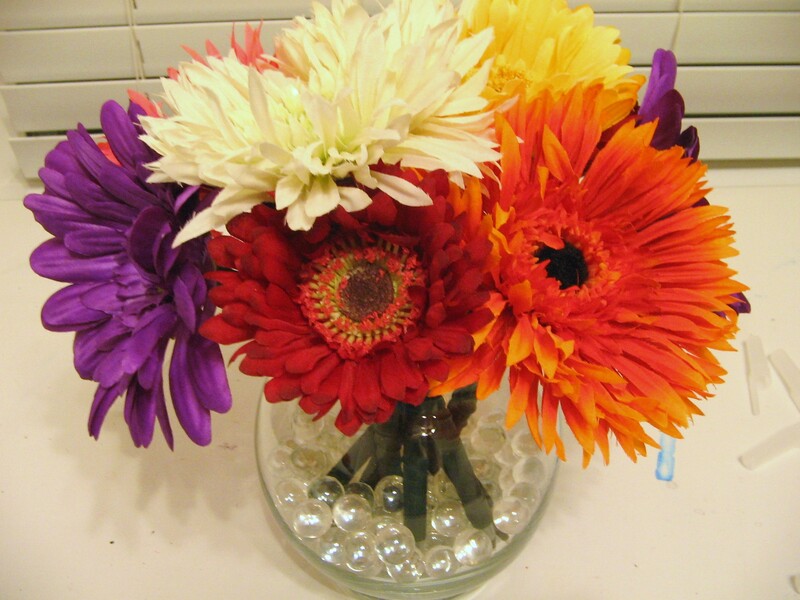 I have not been gifted with the skill for flower arranging, so I went with these big bright Gerbera and Spider Daisies. 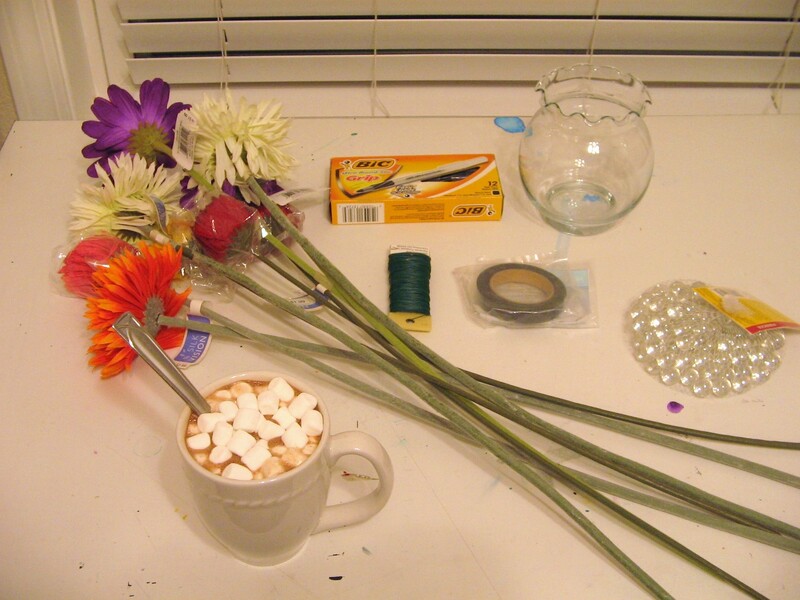 I’d love to hear from you if you’ve tried this craft before, or if you have any wise flower arranging tips to share! 2 Responses to "Be Careful What You Wish For"
Thanks! Yes – crafting is just something for which you need to make a point to block out some time… especially if, like me, you begin to find yourself internally rebelling against the ever quickening pace of life.